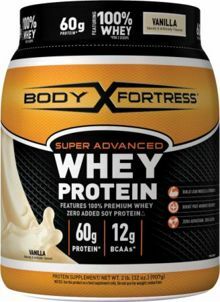 Body Fortress has released a new Super Advanced Whey Protein formula, which has come from the wake of the class action lawsuit filed against them, due to allegations of amino acid spiking to the point of deception. Great news, right? “We inspired industry change!” was our first thought. Unfortunately… no. Not much has changed. In fact, this product is possibly worse than the original, depending on how you look at it! Body Fortress is still adding free form amino acids to the product, and the label is still extremely confusing. First, to the left, you’ll see the original formula. To the right, the new formula. Click the images for a close-up. The New Formula. Now we have “20g protein” (not sure if that includes the Super Recovery Blend) and 6g carbs! The boxes and annotations in red, yellow, and orange are our own. We have a few questions we’d like them to answer, which you can see on both Facebook and Twitter. How much actual whey protein is in each scoop? Does the 20g of protein in the “Supplement Facts” section include the 3g Super Recovery Blend? Update: Body Fortress has responded on Facebook… but unfortunately did not answer the question. Stay tuned! It still includes free form amino acids… and continues to confuse consumers! 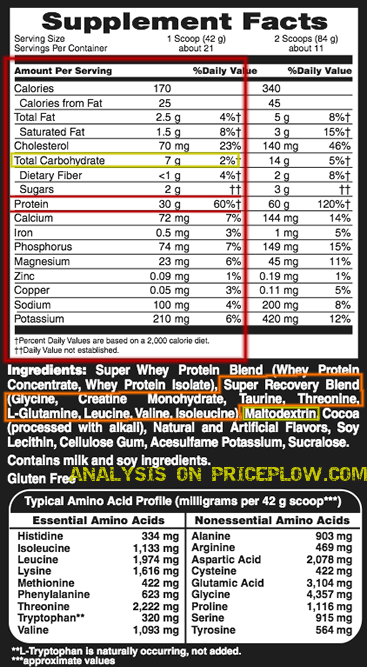 The new formula still has 3g of amino acid “spiking” (in the Super Recovery Blend), which is admittedly “open labeled”. 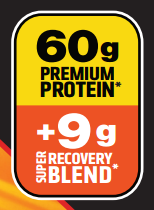 We’re unsure if the new formula is counting the 3g of Super Recovery Blend into the 20g protein on the label. Legally, they should actually include it, per FDA guideline 21 CFR 101.9(C)(iii) 7. Because of that guideline, we’re going to assume that the 3g of Super Recovery Blend is included in the 20g of protein per serving until told otherwise. That would give us 17g of actual whey protein in each 33g scoop, but we can’t be certain how it’s being calculated. Some brands are doing it one way, some are doing it the other way. The label is marketing “60g premium protein + 9g Super Recovery Blend” (per 3 scoops). However, the supplement facts section contradicts this. Again, legally, the 3g of free form amino acids should be counted as protein, per 21 CFR 101.9(C)(iii) 7 which ultimately points to protein quantification being done by the Kjeldahl method. For comparison, what about the old formula’s real protein calculation? According to the class action lawsuit, the original formula had about 21.5g of actual dietary protein (8.5g of AA spiking). We cannot confirm nor deny this. The original formula had 7g of carbs in a 42g scoop (16.67%). The new formula has 6g carbs in a 33g scoop (18.18%). So how did maltodextrin move behind cocoa? In the new formula, maltodextrin is now behind cocoa on the “Other Ingredients” section of the label. How is that possible, given that the ratio of carbs-to-protein has gone up? Our guess is that Body Fortress is either using a cheaper / more inferior form of whey protein concentrate (which has more carbs inside), or they’re using less isolate… or a combination of both of those factors. 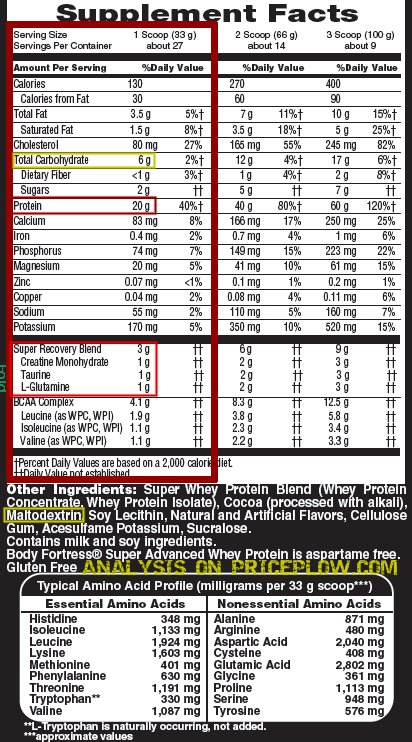 …we’re just failing to see how this label meets its own claims of 20g premium protein plus 3g recovery blend. In the new formula, the amino acids from the “Typical Amino Acid Profile” adds up to 18.246g. 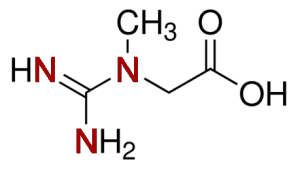 Taurine is not shown here, nor is creatine (this is normal). But once you take away a bit of glutamic acid (which would have been added by the 1g of free form glutamine), you arrive at roughly 17g of protein from amino acids! Note that this calculation might not be perfect, as glutamic acid and glutamine are not interchangeable, and glutamic acid already seems low on the amino acid profile… we’re just failing to see how this label meets its own claims of 20g premium protein plus 3g recovery blend. 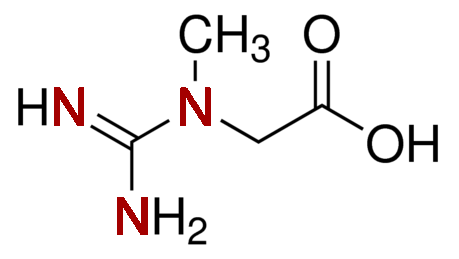 In the original formula, the amino acid profile allegedly totaled 23.665g, which is thrown off quite a bit due to the even-worse-spiked glutamine and glycine numbers. The point of this section is to ask, how does this product have 20g premium protein + 3g recovery blend when the amino acid profile is nowhere near either number? We are potentially missing something here, and will update this post when Body Fortress answers. In the original tub, you had a total of roughly (allegedly) 21.5g x 21 servings = 451.5g of protein in the entire tub. In the new formula, you get a total of 17g x 27 servings = 459g of protein in the entire tub. In the original tub, you had 7g x 21 servings = 147g of carbohydrates. In the new formula, you get 6g x 27 servings = 162g of carbohydrates. Finally, creatine is still in the formula, which means that any Kjeldahl test is going to be more inaccurate in terms of measuring dietary protein. This is discussed in our original amino acid spiking article, due to Kjeldahl measuring for nitrogen, and creatine having multiple nitrogen atoms. Thanks to this, our protein calculations above could be wildly wrong. We simply don’t have enough information right now. In this new formula, we’ve merely gained about 7g of protein in the entire tub, while replacing some of the amino acid filler with even less effective (and cheaper) carbohydrates!! There are several unknowns, the label seems contradictory with itself, the amino acid profile isn’t making sense, and there’s still a fair amount of creatine, which is known to ruin tests. We can’t in our right minds recommend this product as is. Or can we? But what if it’s a good deal? Now here’s the thing. Fair is fair. Body Fortress is considered a “value brand”, so when we see a more open formula like this (we still obviously have our questions), we are willing to bend if the deal is right. For a protein powder to be reasonably priced, we’d like to get over 30g of protein per dollar. That’s currently best deal on 2lbs of Dymatize Elite Whey will fetch you as we write this, and Dymatize is a major trusted brand without any hoopla, shenanigans, or tomfoolery. So that’s our benchmark. In this new formula, assuming the 459g of actual dietary protein, we’ll want to get this tub for $15.30 or less for it to be reasonable. Once this dips below $15 or so, we’re then happy to have a bit extra creatine. And we think Body Fortress may be up to the challenge, given some of their prices on Amazon. At the same time, we’d still rather use something like ON 100% Whey, Dymatize Elite, or Cellucor, since they are using higher quality proteins, have less-confusing labels, and have isolate first. Is the original formula at a reasonable price? Remember to calculate the TRUE grams of protein per dollar. 2lbs of protein isn’t always 2lbs of PROTEIN. Interesting to note, the original formula, which has almost the same amount of actual protein, currently fails to achieve this “reasonable price” for us, as we look at the Body Fortress Whey Protein page on PricePlow. A 2lb tub sounds like a good deal at $17-18, but 2lbs of protein isn’t always 2lbs of protein, as discussed above. How can this achieve hot deal mode? For a hot deal to get set on our supplement deals page, we’ll need to see 40g of protein per dollar. This typically happens in clearance specials, such as when a store is clearing out stock before it expires. For this new formula to ever make it to our hot deals page, we’ll need to see it for less than $11.47. We’re not holding our breath. Well, if you see either of these for less than $15.00, have at it. We don’t agree with the confusing labeling practices, but fair is fair. If you still trust this company and you find it under that strike price, we won’t blame you. Good news is that $15 does occasionally happen on Amazon, so you can always sign up for price drops and wait for it to happen. Until then, stay tuned to our deal alerts by subscribing on the supplement deals page, sign up for price drops on our protein powder page, and check out our Whey Protein Buyer’s Guide flowchart. At the end of the day, we really don’t care what you buy or where, so long as you know what you’re putting into your body and you don’t overpay too much. When we talk passionately about this situation, we don’t think about the 32 year old guy who’s making good money and hitting the weights a few times a week. We think about the 18 year old kid who’s scraping together every last bit of his money to buy protein from a brand that he idolizes. We think about how he’s struggling to make gains and how he needs every last bit of help he can get. He’s the one we’re fighting for. He’s the one who’s worth fighting for. 7 Comments | Posted in New Products, Supplement News | Tagged Amino Acids, Body Fortress, Protein Powder, Whey Protein.